orientation. Bloggers have always been challenged by on one hand having both a surplus of potential success metrics, and a scarcity of data aggregation tools. The new PostRank Analytics (in public beta) changes that, and is a most welcome development in blog tracking and measurement. Just $9/month with a 30-day free trial, PostRank Analytics provides comprehensive success metrics for every one of your blog posts, including page views, average time spent reading, number of comments, tweets, and mentions in social bookmarking sites like Digg and Stumble Upon. All of this data is presented in one, easy-to-understand layout that allows you to quickly compare your posts to see patterns of success. 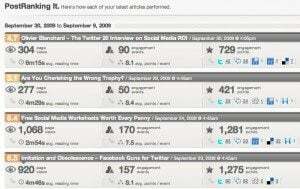 PostRank Analytics also includes an aggregated “engagement score”, numerical shorthand for how each post fared. 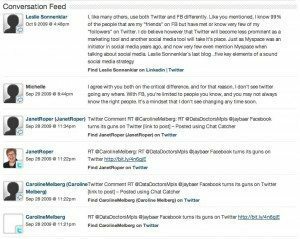 The engagement score is created using an algorithm that takes into account the other metrics such as comments, tweets, etc. It’s not dissimilar from Facebook’s engagement score mechanism on fan pages. To utilize PostRank Analytics on your blog, just create and account and configure your Google Analytics account to sync with PostRank Analytics. This requires you logging in to your Google account and enabling this connection, a 5-minute procedure with no technical skills required. You do, however, have to have a Google Analytics account for PostRank Analytics to provide sufficient value. 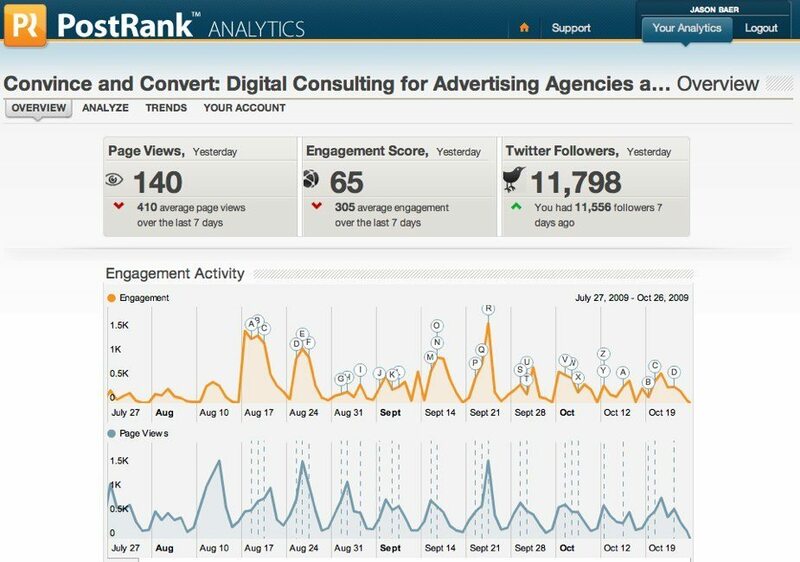 One of the other useful features of PostRank Analytics is that you can get your daily metrics, including your engagement score, emailed to you in a tidy, easy-to-understand format. Perfect for distributing to all of your team members in a group blogging situation. Additionally, PostRank Analytics lets you see who is engaging with each of your posts, providing a tidy list of tweets, diggs, comments, etc. all in one place. You can also see trend data that charts how frequently people engage with your content over time in each social outpost. There are still some kinks to work out (on occasion, links do not work, etc.) and the methodology and context behind “engagement points” calculation is still a bit mysterious (PostRank claims they are working on a more detailed explanation), but for serious bloggers, I recommend you give PostRank Analytics a try. It’s an elegant way to chart your progress and refine your content. The daily email reports alone are worth the two lattes per month fee. 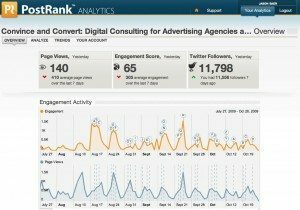 Have you tried Postrank Analytics?